This post is a collection of notes I assembled throughout this year to help me lose weight. Although you may find value in the notes below, I’m putting this post together as a reminder to myself on how to think about fat loss when I struggle or plateau. In the post Overcoming False Health Beliefs to Lose Fat, I covered the ideas I moved away from. This the flipside. This is the template I designed to get the mental focus and motivation I would need to succeed. I broke the fat loss journey into 5 phases. The Why – Clearly define the reasons why you want to lose weight. Drill into your motivation. Do this regularly. The How – Create a plan. Believe in the plan before starting. Use the power of story to make it personally motivating. The How includes both the plan to lose the weight and the plan to keep off the weight. The Process – How are you going to execute your plan? Day to day. Meal by meal. It is one thing to design a top-down plan, but to be successful, one needs to drill down into the details. How do interact with friends and family? Will you share your goal or not? Imagine getting support and not getting support. Plan around challenges you know will experience. This could be work or travel. The Process is ongoing but needs more attention early in the diet. The Process should be designed in a way that builds positive habits. Plan For Failure – How will you respond if you are not getting the results you want? How will you deal with setbacks? The time to think about these questions is before they happen. Imagine failure and have a plan ready for how you will respond. Plan For Success – How will you respond to success? Many times as we make progress we underestimate the effort it took and reduce our effort. Don’t declare victory too soon. Motivation should not decline as the diet progresses. When I look at the list above, I would estimate that 99% of nutritional writing focuses on #2 The How. And just the part on losing the weight with almost no discussion on keeping off the weight. I wanted to know why so many people failed to lose weight and then why so many that lose weight failed to keep the weight off. Although every story is different, my guess is many didn’t fully internalize their motivation. And if they did, they didn’t do it regularly. I also believe people don’t plan for success or failure. Too often they relax when winning or quit when failing. It is human nature. Understanding that before it happens and having a response already planned out is a strategy I’m using. Here is the 4 step process I execute when I’ve stalled or even gained during a diet. Review The Why. Use this as an opportunity to drill into motivations. Confirm The How is accurate if the stall has been for more than 3 weeks. Review The Process. Tighten up any sloppy behaviors. Find the leaks in the plan. Patch them up. Move Past the Disappointment and continue. When the inches or pounds come off, here is how I plan my response. Acknowledge briefly. I think about my story and the effort it took. A moment of gratitude. Remind myself to not let up. No victory laps. No bragging. A person that loses 15 pounds of their 30-pound goal, should not lose 50% of their motivation as they get leaner. But we often see that happen. Another concept I think about frequently is that idea that if you are over your ideal weight, you are there because you used food as a form of entertainment. You consumed more calories than you needed to nourish you at your ideal healthy weight. The reason you did was the food served as a form of entertainment. If could have been the food tasted good or you ate as a way to reduce boredom, but regardless you took too many calories from the environment and now they are on your body. Every month I pay 100% of my bills in full. I have zero debt and my credit score is very high. What if we imagined body fat as a form of debt. Being heavy is a very visible example of living beyond your means. If you “earn” 2,400 calories a day via lean muscle and activity and you “spend” (aka eat) 2,500 calories a day for months and years on end, you will be carrying a fat balance that needs to be paid off. The financial analogy might be silly to some, but inspiring to others. Personally, I never want to pay interest or a fee, so thinking of any excess fat as carrying a balance is highly motivating to me. I went into detail on cravings in the post How I Beat Food Cravings on the Peasant Diet. The short version is when thinking of high flavor foods to eat, pause – eat something boring (high protein or high volume) – wait 20 minutes. The craving will usually be killed or greatly wounded. Repeat this process. make it a habit. It gets easier. Have the foods you use to kill cravings stocked at all times and prepared if possible. The numbers are clear. The vast majority of people that lose weight gain some or all of the weight back at the end of the diet. Some gain even more. My speculation on the reason is that they never believed they were eating day in and day out a high level of calories when they were heavy. Many people believe a series of incidents is why they are heavy and not their daily habits, so when they lose the weight, they resume their old calorie level and make an effort to reduce incidents. Only now they have a lower LBM (lean body mass) and they need fewer calories. The result is a slow increase in weight. See The Role of Exercise in Preventing Weight Gain for a deeper discussion on this topic. When I started my current diet, I knew from the math that If I wanted to be at 190-200 and not at 222, I would need to consume fewer calories, not just during the diet, but every day afterward. Period. In short, I’m not declaring victory until a full year has passed after the weight has come off. At that point, my new lower levels of eating should be a firm habit and my metabolism will be up a bit. I hope this post was useful to someone. 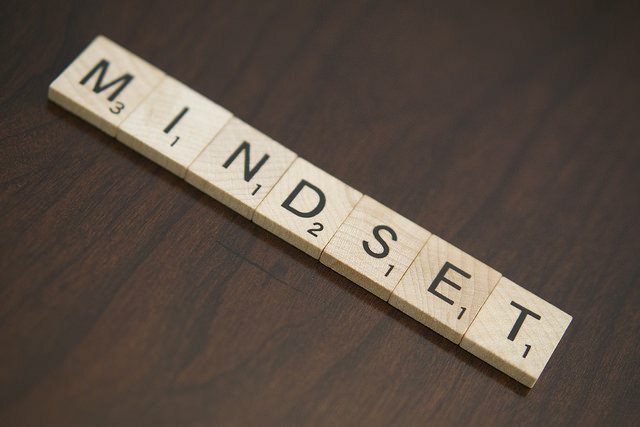 If you have any Mindset tips you use to help when dieting, please leave a comment below. Next Did I Gain Weight After the Potato Hack? Previous Can April Fools Day Be Saved? I’m motivated by the idea that whole foods with high protein and fibre should lead me to my optimal weight without suffering and reveal the hard earned muscles. Also that my mass:fat ratio will improve and the stairs, hills and trees will be even easier than now. I think it was Yoni Freedhoff who said you should eat the way to get maximum benefit while the diet still being enjoyable, not tolerable, for the rest of your life. So there is no goal timetable. Just the days I do my best and immediately get back on track without guilt if there’s a “mistake”, knowing that even a single pigday doesn’t mean much at all. I’m thinking this is going to be incredibly useful – going to spend some time on this over the weekend. so glad you started sharing again, thank you!